Anthem lowered its net earnings per share target for 2016 after posting a first-quarter drop in profit and recording one-time charges, but reaffirmed its adjusted earnings and outlook for the rest of year. The Indianapolis-based health insurance carrier also is optimistic about the Affordable Care Act's exchanges, which have been at the center of political and business debates since UnitedHealth Group decided to exit many of them. Anthem ended the first quarter with 975,000 individual ACA exchange members, up about 23% with 184,000 more people than at the end of 2015 and well ahead of what the insurer expected. People living in areas where the ACA's not-for-profit co-ops folded helped boost enrollment. “We do believe we're well-positioned for continued growth in the marketplace,” Anthem CEO Joe Swedish said on a call Wednesday. But that also assumes the marketplaces will level out, he added, noting the suspension of the ACA's health insurance tax for 2017 likely will help keep premiums down. However, net income decreased 19%, from $865 million in the first quarter of last year to $703 million the same period this year. That equated to $2.63 per share. Anthem, a Blue Cross and Blue Shield affiliate in 14 states, said net income is now expected to be “at least” $9.65 per share on the year, down from “at least” $10.35. 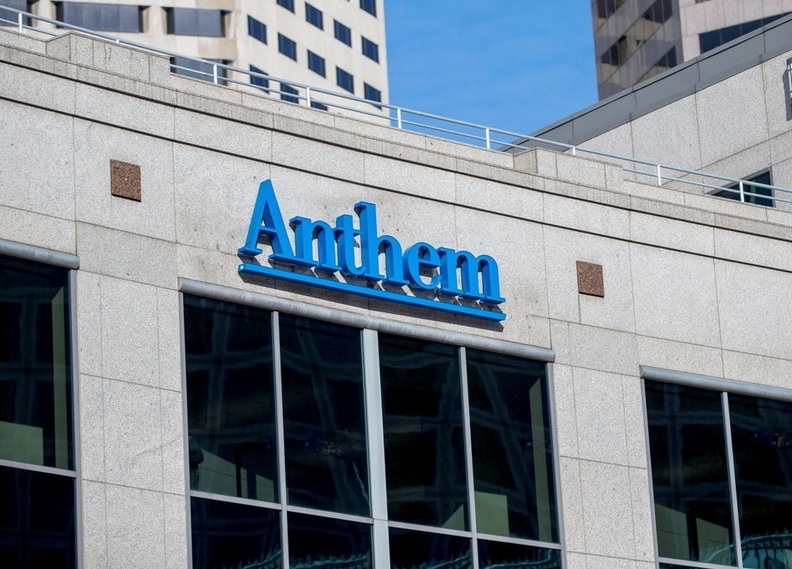 That of course could change again, depending on what the U.S. Justice Department and state regulators decide to do with Anthem's pending acquisition of rival Cigna Corp. Last summer, Anthem agreed to buy Cigna in a deal valued at more than $54 billion. Full approval has not been given yet. Anthem blamed a drop in profitability on the extra calendar day in the leap year, as well as a rise in the medical-loss ratio. The first-quarter MLR was 81.8%, up from 80.2% in the same period a year ago. Medical costs were higher in the health insurer's Medicaid and individual exchanges, but it did not provide specific figures for those segments. Total revenue jumped 6.5% to $20.3 billion in the quarter. Medicaid, Medicare and other government payers cumulatively represented 53% of revenue. Anthem expects revenue will hit upward of $82 billion by year-end. Anthem had 39.6 million health insurance members as of March 31, a 2.8% increase from the same time last year and a 2.6% jump over the past three months. Medicaid membership soared the most, by 7.6% year over year to more than 6 million people, while the individual ACA-compliant plans stayed steady at 1.9 million. That includes members who bought plans on and off the exchanges.